Blurb Description: The beast raged; it punctured the air with its spite. But the girl was fiercer. Tea is different from the other witches in her family. Her gift for necromancy makes her a bone witch, who are feared and ostracized in the kingdom. For theirs is a powerful, elemental magic that can reach beyond the boundaries of the living—and of the human. Great power comes at a price, forcing Tea to leave her homeland to train under the guidance of an older, wiser bone witch. There, Tea puts all of her energy into becoming an asha, learning to control her elemental magic and those beasts who will submit by no other force. And Tea must be strong—stronger than she even believes possible. Because war is brewing in the eight kingdoms, war that will threaten the sovereignty of her homeland…and threaten the very survival of those she loves. It’s taken me a while to get through this book, but now that I’m done, I find that it’s occupying all of my thoughts. I’ve been thinking of Tea, Fox, the daeva, the rest of the Asha, the Willows and the asha-ka so often, it’s only slightly discerning. 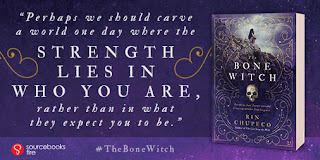 Basically, The Bone Witch is a deep, gorgeous fantasy filled with exquisite power, dark creatures and a characters that will stay with you long after they’re gone. Tea Pakhlavi used to be nobody. Until the day she raised her brother from the dead, on the day of his own funeral. In the kingdom of Odalia, Bone Witches are ones to avoid. They can raise the dead and compel the living and are the only witches that can control the daeva, creatures made out of nightmares that want nothing but death and destruction. Tea is taken away from her home, and her country to live with other Asha – the most powerful of witches. As a Dark Asha with immense power, Tea is quickly introduced to a world of scheming, darkness and power that is hidden under a mark of beauty, grace and perfection. And the world will never be the same for it. One of the things I loved the MOST about the book WAY the story was told – the first with Tea where she began as an Asha Novice, and to where she is now, an exiled bone witch with immeasurable power in the Bay Of Skulls, plotting her revenge against everyone that wronged her. It was such an intense feeling, seeing her begin as someone who didn’t know what she was capable of to a force to be reckoned with and IT MADE ME LOVE HER ALL THE MORE. While this book was the start of her path, I CANNOT WAIT for Rin Chupeco to fill in the blanks. Another thing I loved was the ATTENTION TO DETAIL. Whether it was politics, secondary characters, the plot or the magic, this book HAD IT ALL. There were so many characters and places and kingdoms that overwhelmed me at first but WOW did it all come together and make me fall in love. One of the things I DISLIKED was the slow pace of the beginning, and it took FOREVER (about 30%) of the book for me to even feel like I was enjoying it. However, the only thing that REALLY bothered me was the relationship between Prince Kance and Tea. It felt like SUCH A CLICHÉ PLOT POINT AND I WANTED TO ROLL MY EYES. Apart from a few interactions, we SUDDENLY hear that OH DAMN “Stay away from the Prince” and “You’re a danger to him.” And I a) WAS NOT FEELING IT and b) could not FATHOM the romance between then and c) WAS NOT FEELING IT. Will I be reading the sequel? HELL YES. Will I be hoping to see more Dark Magic? UHM YES. A deeply woven, must-read fantasy book for all lovers of the genre (and an anti-hero.) 4 stars. Have you read any previous Rin Chupeco books? 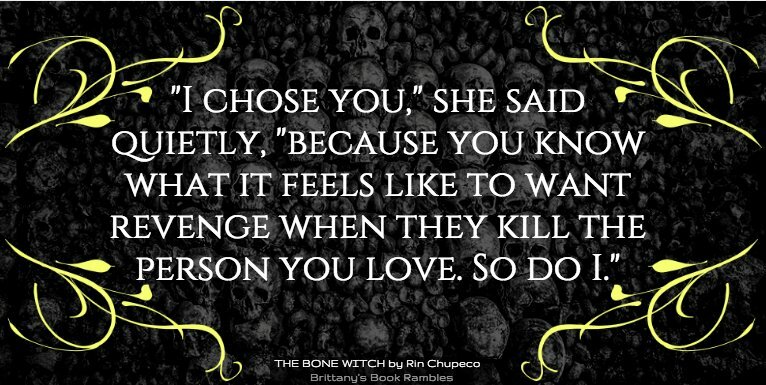 Have you read The Bone Witch? ISN'T IT GORGEOUS?